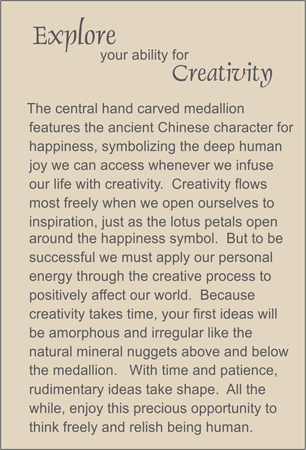 MEDALLION: Poppy-colored serpentine hand carved medallion presenting the open petals of a lotus flower surrounding a central happiness symbol. ACCENTS: Yellow ambronite nuggets and small quartz crystal ellipses. COMMENTS: Bring the flower of creativity to your favorite hostess. See Creativity with regular size loops by scrolling down.